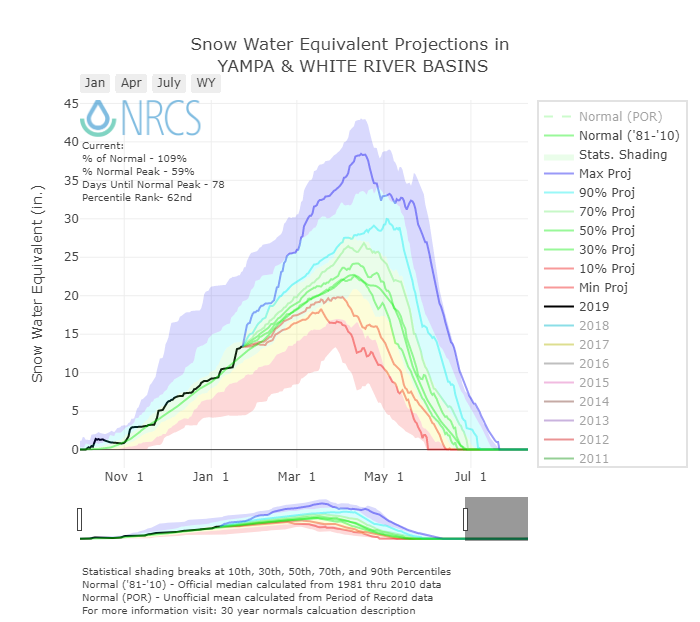 So far this winter Northern and Eastern Mountain Basins have maintained a near average snowpack while parts of Central and Southern Colorado have limped along, with the nagging worry that we’ll keep slipping into the realm of WY2018. 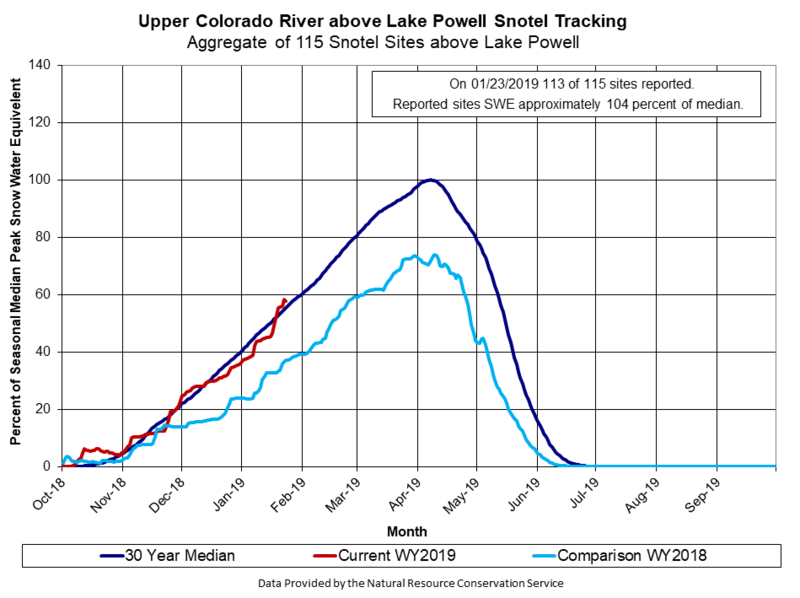 But recent storms have resulted in a pretty steep increase in SWE throughout Colorado as a whole. 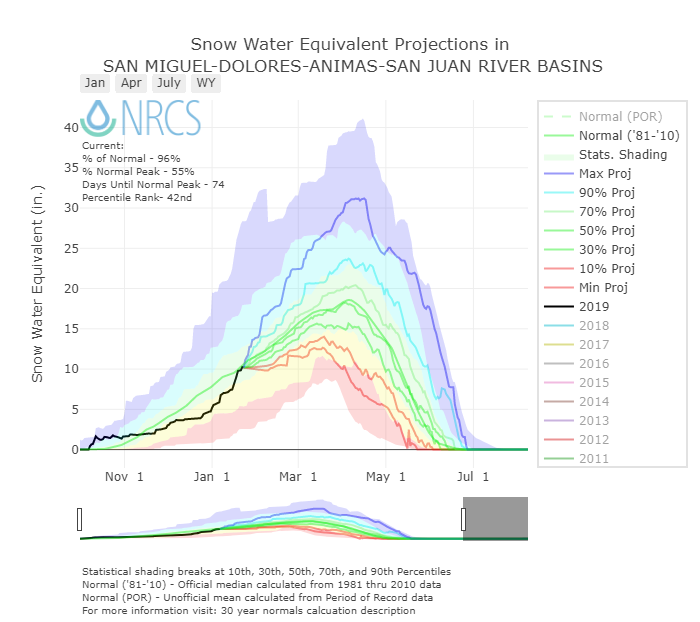 The San Miguel/Dolores/Animas/San Juan Basin is near average while the Rio Grande – having not benefitted as much from the recent storms – is currently 86% of median. 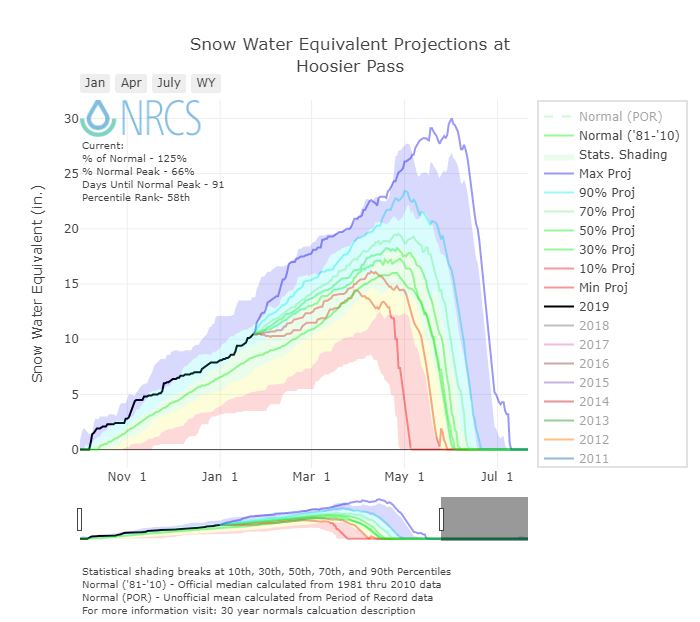 NOAA’s January 1st forecast estimates 50%-90% runoff from a combination of the near/below average snowpack and very low antecedent soil moisture conditions, keeping many basins in drought. It’s hard to shake a severe to exceptional drought. So far this winter season we have remained dust free of any noticeable dust deposition at Senator Beck Basin Study Area at Red Mountain Pass. Starting in March we will begin touring Colorado monitoring dust-in-snow conditions throughout the remainder of the accumulation and ablation season. The desert southwest has received an average or above average dose of precipitation this past month. While the Four Corners region is still in an exceptional drought it is improving, and wetted soils are very much a good thing when it comes to resisting becoming airborne during high wind events making their way to Colorado. 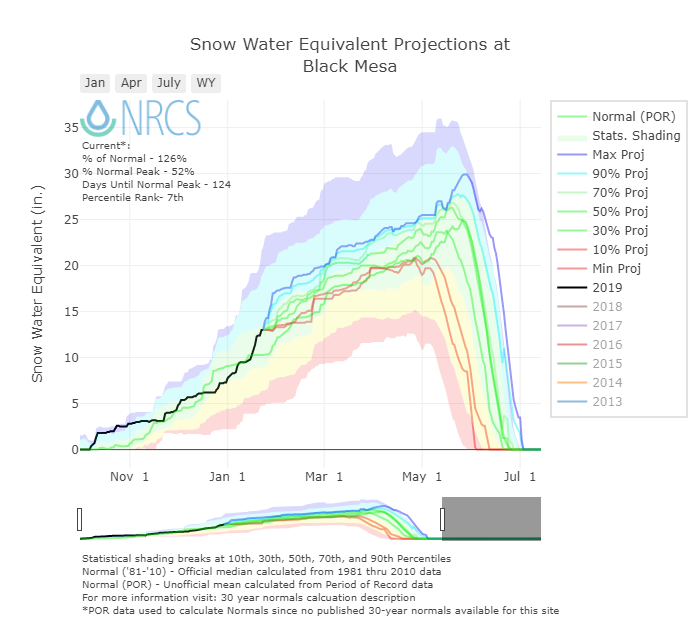 The snow accumulation season is about half over and after the recent string of storms these last couple weeks it is a good opportunity to see where our snowpack stands. Below are SNOTEL station and basin project plots for Colorado along with the usual forecast images. A big thank you of gratitude to all the furloughed federal employees persevering during this shutdown. The storms keep rolling through, you got to love that. The next system is expected to benefit Northern and Central Colorado with a little spillover into the Northern San Juans. Please see snowfall forecast map below. It is important that anybody who spends time in the backcountry in winter read this report. It highlights the crucial role of being informed, and integrating and acting on information in avalanche terrain. If you don’t receive our storm reports you might not have heard, on January 5 a skier was caught, buried, and killed in an avalanche in Upper Senator Beck. The skier was part of an avalanche level 2 field class with Silverton Avalanche School – not affiliated with CSAS. In all, six people were caught in the avalanche and thankfully five people made it out ok. Snow School: There is still space available in our Snow School for Water Professionals, our two and half day combination classroom and field class designed for water professionals wanting to learn more about snow and our mountain systems. Please contact me with any questions. Outdoor Retailer Show: If you are planning to attend the Outdoor Retailer Show this Jan 30-Feb 1 stop by the non-profit section and say hi and get a sticker.